Prior to reading the book, I didn’t think I owned that much. Although I didn’t like to throw things away, I also didn’t buy much. I’m not particularly fashion-conscious and thus hadn’t built up a wardrobe. Most of my hobbies are digital and don’t take up much physical space. However, when Julie proposed the Kondo book, I was interested. In case you missed the trash bags outside many American homes, the KonMari Method has literally swept the nation as a way to get rid of possessions. It’s quite simple: only keep things that “spark joy” in you. To get there, hold every possession in your hands individually. If you get an emotional response, you can keep it. Otherwise, throw it away. Do this category-by-category as quickly as possible in one big purge so you can shock yourself into a new mindset. After that, you will be cured and never accumulate clutter ever again. Or so she claims. I get it. Whenever she gets home after work, she says “Hello!” to her physical house, unpacks her entire purse, and thanks the bag for its service. She has a sock folding technique so that you don’t “hurt” your socks that have served you so well. She tells stories about clients who, after having cleaned out their houses, have had cathartic bouts of diarrhea or determined that they needed a divorce. Like many authors, she apparently seems to solve all of the world’s problems with her one idea. But since we were reading it for book club, we couldn’t just read it: we had to give it a shot, so last summer, Julie and I tidied up. 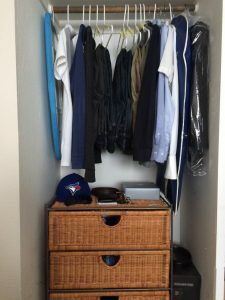 Kondo recommends that you start with clothing (since it’s comparatively easier than, say, mementos), so we pulled out every article of clothing that we owned and threw them on the ground in our living room to pare down. Altogether, I owned 173 articles of clothing. For someone who, more or less, wears the exact same stuff every 2 weeks between loads of laundry, that number sounds big. So we started going through it as instructed. I held the first t-shirt in my hands, stared at it, laughed at myself, refocused, thought deeply, and waited for an emotional reaction. When I didn’t get one, I said out loud, “thank you for your service” and put it in the trash bag. Julie and I laughed to each other about it, felt some embarrassment, and then kept going. We laughed a few more times, but it quickly became normal. 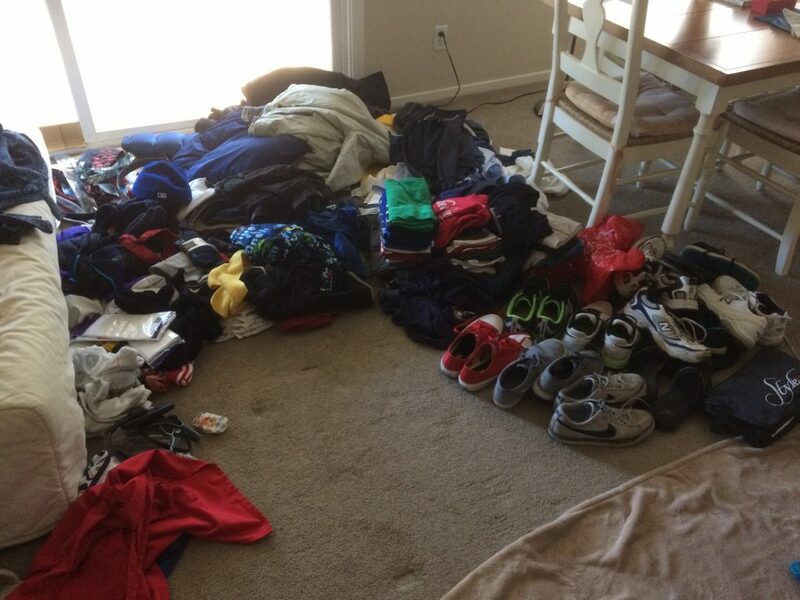 By the end, I had thrown away more than 30% of my clothes, and together, we had filled two or three large trash bags. 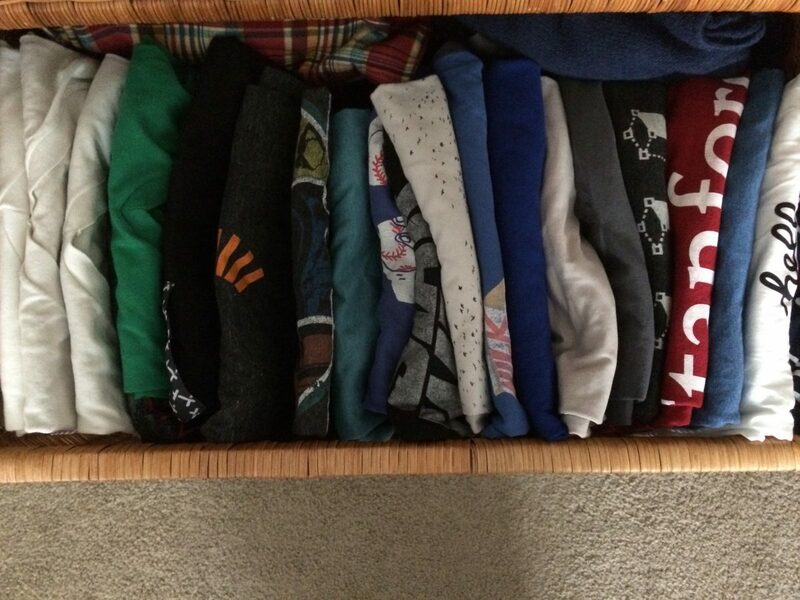 Many were poorly sized t-shirts from college or work of sentimental value that frankly had outlived their usefulness for anything other than filling empty space in the back of my closet. Others were gifts, like jackets, that I never found a specific use for. In the end, I managed to fit basically all of my clothing into one closet. Kondo says you should keep a shrine of your favorite things, so I left my Jays hat out. 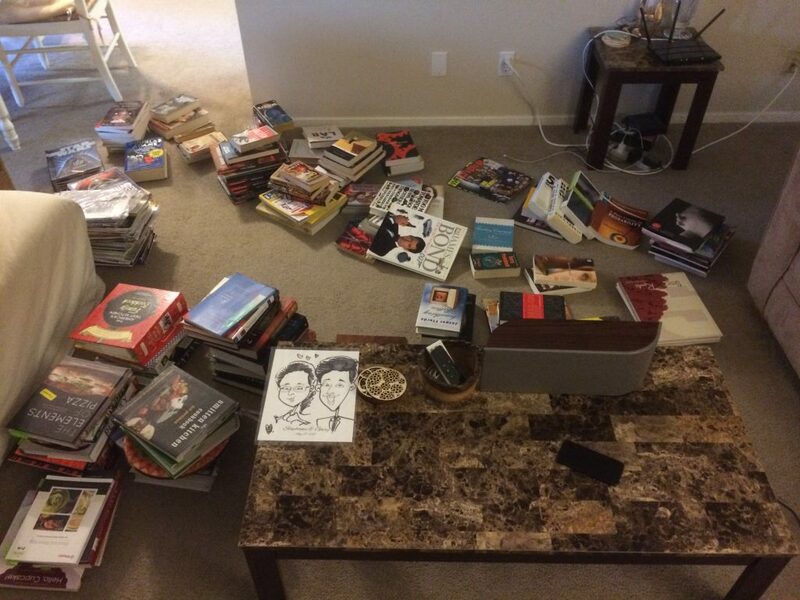 Having successfully cleaned out our closets, we proceeded with our books about a week later. Up-to-date blog readers will know that I’m unsentimental about books, and we ended up donating about 25% of our collection. Many were were college textbooks that we likely didn’t even read once. I had hoped to discard more, but we really do love our cookbooks and couldn’t part with those. Although 25% may not seem like much, discarding books has been an ongoing process. Many of the keepers were only until we read them, at which point we could donate them. My annual goal to work through the cookbook Plenty was in part inspired by my desire to enjoy my cookbooks more. And when we went back to our parents’ houses over the holidays, we decimated our childhood book collections. Julie condensed the equivalent of 10 shelves of books to only 3 shelves, and I got rid of several boxes of science fiction books, Dilbert comics, and more in my old closet. Across the rest of our place, we thoroughly decluttered. Our bathroom drawers and closet were filled with unused toiletries, expired medications, and samples. I cleared out two drawers full of receipts, documents, manuals, and other random papers, which were reduced to one folder of essentials and another of monthly receipts, which we clear out with bills every month. I enjoyed rifling through old ticket stubs and birthday cards but promptly sent them to the recycling bag. The effect wasn’t so radical everywhere. Our kitchen is more or less the same, but the gadgets do spark a lot of joy. We rearranged some knick knacks on our bookshelf, and I took some to decorate my office desk, but we kept many of those pieces, too. Kondo made the bold claim that her clients never relapse and never regret the things that they discarded. In the past 8 months, I have wished that I had kept a handful of items. However, we haven’t visibly relapsed, and I am much more comfortable sending items onward to the dumpster when they have fulfilled their service. The shock therapy did change our mindset to tidying up for the better. Having discussed this topic both in book club and subsequently with friends and family, I have learned that everyone has strong opinions about material possessions. 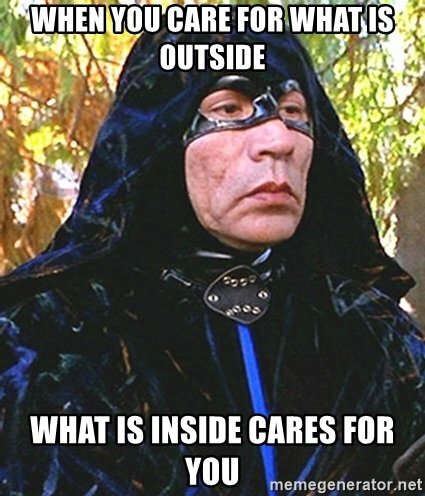 Although politics is a third rail these days, I would encourage everyone to discuss “stuff” because it is fascinating and charged without being sensitive (assuming the parties don’t live together). The KonMari Method worked for us, but every household and its inhabitants are different, so your mileage may vary. Kondo and her book are very odd, but give it a real shot. It doesn’t take much to hold a t-shirt in your hands to see if it sparks joy in you. Hopefully you can at least laugh at yourself about it. thank you for sharing the process. I was dubious about the book but it seem to effective for your household.